This is an introduction to using the Kodiak high performance computing cluster. It is intended for users with little or no experience with "Unix-like" environments such as Linux. Experienced users will probably want to skip this and read the Kodiak User's Guide which goes into more detail on how to compile and run programs on Kodiak. Although this document is not meant to be a comprehensive tutorial on Linux usage, hopefully it will be enough for you to get started. Note: This document is a "work in progress". If anything is unclear, inaccurate, or even outright wrong please send email to Carl_Bell@baylor.edu. You will need an account to use Kodiak. Kodiak accounts are available to Baylor faculty, graduate and undergraduate students. To request an account, contact Mike_Hutcheson@baylor.edu and/or Brian_Sitton@baylor.edu. Students should have their faculty sponsor request the account on the student's behalf. Accounts are also available to non-Baylor individuals who are collaborating with Baylor researchers. Once your account is created, you should receive an email with your username and your account's initial password that you will use to log in to Kodiak. To log in to Kodiak, you will need to use ssh. Microsoft Windows users should use PuTTY which may be downloaded from their official site. When you run PuTTY, you should see the "PuTTY Configuration" window. Specify "kodiak.baylor.edu" as the Host Name (or IP address) and click Open to connect. Enter your username and password to continue. Mac OS X users should connect with the ssh command in a Terminal window. The Terminal.app program can be found in your Utilities folder. (At the Finder, select the Go→Utilities menu.) Linux users should connect with the ssh command in an xterm terminal window or the console. The actual command is ssh username@kodiak.baylor.edu. Note: In this document, we will use "bobby" as your username. Why does the prompt say "login001" as the system name instead of "kodiak"? It just does. And what is meant by "current working directory" and why is it "~"? We'll get to that in a minute. Note: To make things a bit easier to read, this document will usually omit the [user@host directory] bit and just use $ as the prompt. So you are now sitting at the prompt. What next? To do something, type a command along with any any options and arguments that the command needs and press the return (or enter) key. For example, to see a list of users currently logged in, type who and press return. Note: You always need to press return to run a command, so from now on, pressing return is implied. Commands often have options associated with them. For example, to add column headings to the output of the who command, add a -H option. Try `who --help' for more information. Not all commands support the --help option. The best way to get detailed information about commands is to read the on-line manual with the man command. Entries in the on-line manual also known as man pages. Changing password for user bobby. Password formats on Kodiak are somewhat strict, so keep trying. You will get 3 attempts before the passwd command gives up. Just try again. When you are finished working on Kodiak and are ready to log out type logout or exit. You can also press control-D (^D) to log out. Note: It is common to use the "^" character as an abbreviation for "control" key sequences and we will use it from now on. Just remember that if you see something like "^X" it means "control-X". Linux organizes things the same way except it uses the terms "directory" and "file" instead of "folder" and "document". Actually, Windows and OS X also use "directory" and "file". Folders and documents are just metaphors used in their graphical user interfaces (GUI). There are also GUIs avaialable for Linux that display directories and files as folders and documents. Because you will be using a command line interface on Kodiak, we'll stick with that. A path to a file or directory that begins with "/" (the root) is considered an absolute or full path and specifies a file or directory explicitly. If a path does not start with "/", it is considered a relative path and specifies a file or directory starting with the current working directory. Something to keep in mind is that Linux file systems are case sensitive. In other words, the files "letter.txt" and "Letter.txt" are two distinct files. Also, some operating systems (e.g., VMS) support the concept of file versions. This is not the case with Kodiak. When you first log in to Kodiak, you will be "in" your home directory. Whichever directory that you are currently "in" is considered your current working directory or working directory. To see the full path to your current working directory, use the pwd (print working directory) command. So what's the deal with the "~" character in the prompt? That's just an abbreviation or shortcut for your home directory. You can often substitute "~" when referring to something within your home directory. For example, "~/pictures/family" would be equivalent to "/home/bobby/pictures/family". In the example above, the current directory (i.e., ".") 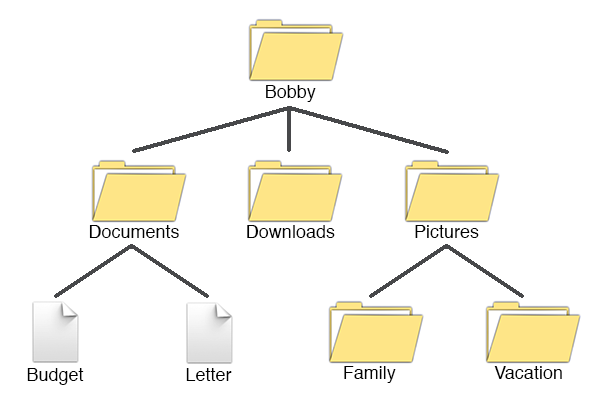 is "documents" (full path /home/bobby/documents) and the parent directory (i.e., "..") is "bobby" (full path /home/bobby). You can usually refer to a file or directory within the current working directory just by its name. So if your working directory is "/home/bobby/pictures", you can refer to the family subdirectory as simply "family". But you could also refer to it as "./family". As you will see in a bit, there are times that it will be necessary to refer to a file using "./". Also, assuming your current working directory is still "/home/bobby/pictures", you can refer to the letter file as "../documents/letter.txt". Okay, you've logged in to Kodiak and are in your home directory. Now what? To change your current working directory, use the cd command. You can see that you specify a directory with either a relative or full path. To change back to your home directory, you can use cd ~. Because your home directory is the default directory for the cd command and will be used if no directory is explicitly supplied, you can omit the ~ if you wish. Just using cd to navigate directories is all well and good if you happen to have all of the files and directories memorized. Since you probably don't, it would help to see a listing of a directory's contents. You can do this with the ls command. What would be printed out if there was nothing in the directory? Nothing, then just the prompt. When viewing the directory listing generated by ls, how can you tell if an entry is a directory or a file? One way to do this is to add the -F (or --classify) option. With the -F option, the names of directories have a "/" after them. The -F option will append other characters for other types but we won't list them here. You may have noticed that by adding the optional argument "documents" to the second ls command, you didn't have to cd to the directory. Another way to get more detailed (or long) information from the ls command is to add the -l option. $ ls -l -F .. There's quite a bit of information here. Right now, we will just take a look at the line for "documents". The first character tells what the entry actually is, in this case "d" for directory. An ordinary file would have a "-" as the first character. The next 9 gobbledygook looking letters (rwxr-xr-x) are the entry's permissions. We'll talk about permissions later. Just ignore the next number. The next two columns are the entry's owner (bobby) and group (users), and are related to the permissions. The remaining columns are the entry's size in bytes, the date it was last modified, and its name. Notice how we got fancy with the last command above and used multiple options, -l and -F as well as the parent directory ".." as the argument. Another useful option is -a which tells ls to include entries that begin with a dot. When a file begins with a dot, it is considered hidden. This is not for security reasons (i.e., "security through obscurity") but is more of a way to help de-clutter things. You can see that both the current directory '.' and parent directory '..' are now included in the listing, along with some file named ".bashrc". Also, note that the options were combined, -laF instead of -l -a -F. Many commands can do this. To create a directory, use the mkdir (make directory) command. Now that you can navigate around directories and see what's actually in those directories, it's time to start working with files. If you want to see the contents of a file, use the cat command. adversarium ne, nisl tota convenire at pri. dictas corrumpit euripidis no vim. in liber quodsi lobortis, quis altera essent at his. mel. An rebum sententiae incorrupte eum, sea timeam similique ne. Where did the name "cat" come from? It's an abbreviation of "catenate" or "concatenate". So what does that have to do with displaying a file? The cat command actually concatenates all of the requested files and prints them out. If you wanted to see both files, letter.txt and budget, you would have run cat letter.txt budget. Sometimes, a file is too big to display all at once. Instead of cat, you can display a screen at a time with the more. When the output pauses, press the space bar to continue. There is also a similar but more powerful command, less, which you will probably end up using instead. If you don't want to view the entire file, you can use the head command. This will display just the first 10 lines. To see the last 10 lines of a file, use the tail command. A very useful option for tail is -f which tells tail to output appended data as the file grows. We'll use this when we see how to run programs on Kodiak in part 2. To copy a file, use the cp command. You can simply supply file names and it will copy the file in the current directory. If you want to copy the file into another directory, use the path to the destination as the second argument. If the destination is a directory without a file name, then the file will be copied to that directory and keep the same name. What if, instead of copying a file somewhere, you wanted to move it there. In that case, you would use the mv command. The mv command is also used to rename a file. You can also move and rename a file at the same time by using a path to a file (as opposed to a path to a directory) as the destination. mv is also used to move or rename a directory. Be careful. If you cp or mv a file to a file that already exists, you will overwrite the file. Both cp and mv have an option -i (--interactive) which will ask you to confirm if you want to overwrite an existing file. To delete a file, use the rm (remove) command. To delete a directory, use the rmdir command. Note that rmdir will only delete a non-empty directory. How does one edit a text file on Kodiak? There are several text editors installed: vi, emacs, and nano. The simplest editor is nano. To edit an existing file, run nano with the name of the file as its argument. To create and edit a new file, run nano without an argument or with the name of the file you want to create. You will then see something like the following. You should be able to use the arrow keys to move around the document and type to modify it. Available commands can be found at the bottom of the screen. For example, to get help for using nano, press ^G. When you are finished editing your file, press ^X to quit and you should see the following. Press "Y" if you want to save any changes, or "N" to ignore any changes. To go back to editing the document, press ^C. If this is a new document, you will then be prompted to enter the name of the document. Just type in the new name and press return to quit. The vi and emacs editors are more powerful than nano but consequently are also more difficult to use. We won't describe how to use them here other than explain below how to quit them in case you do happen to run them. Because nano is fairly limited, it is recommended that you learn to use vi or emacs at some point. There also are graphical editors on Kodiak as well. These include gedit and the aforementioned emacs. To use them, you would need to be running an X11 server on your desktop system such as Cygwin/X or Xming for Microsoft Windows, and XQuartz for Mac OS X. To quit emacs, press ^X then ^C. You might see C-x C-c at the bottom of the screen before it actually quits. It's possible that you will be asked if you want to save the file. To quit without saving, press "n". If you are told "Modified buffers exist; exit anyway?" answer "yes". You have to type "yes", not just "y". The "*" character doesn't have to be at the end and you can also use multiple wildcard characters. Want to get a list of pictures from the 4th of July no matter what year? What about using "*" by itself as in ls *? Because "*" matches zero or more characters that should match any and all files in the directory, right? Well, not necessarily. It turns out that there is an exception to wildcard name matching. Files that begin with "." (hidden files) are not included. Wildcards are not just used with the ls command. Most commands that take files as arguments can use wildcards. Another wildcard character that is worth mentioning is "?" which matches exactly one character. There are also other wildcards that allow you to match ranges of characters, negate matches, etc. You will probably find yourself using wildcards quite often. Above we mentioned "permissions". Permissions are used to restrict (or allow) access to files and directories. Each user on Kodiak has a username and is a member of default group. Here, the username is "bobby" and the default group is "users". Users can also be members of other groups, not just the default. You can use the id command to see your username and group membership information. You can also use the whoami and groups commands to display your username and group membership. So what are those numbers, 520 and 100? Users and groups are actually identified by numeric values called user identifiers and group identifiers. These are often abbreviated as "uid" and "gid". The names "bobby" and "users" are really labels associated with uid 520 and gid 100 and are used to make things easier for humans to read. Yes, as far a Kodiak is concerned, you are just a number. Each file (and directory) has a specific owner and group associated with it. That is, a file is owned by a specific user and assigned a group. Using ls -l we can see the files' owners and groups in the output. Want to see the numeric uid and gid instead of the username and group name? Use ls -n.
drwxr-x--x  6  bobby users   5 Oct  8 15:27 .
drwxr-xr-x 115 root  root  114 Oct  1 14:09 ..
As you can see, almost all of the items have as the owner "bobby" (that's you) and group "users". Note that the parent directory '..' (in this case, "/home") is owned by "root". The user "root" is the system administrator account and is sometimes called the "superuser". This tells us that the owner of letter.txt (bobby) has read and write access but not execute. Members of the group "users" have read access but not write or execute. Likewise, everyone else also has read access but not write or execute. To modify permissions of a file or directory, use the chmod (change mode) command. To set or add a permission, that is, to allow that permission, you would use the argument class+permission. For example, to give everyone/others read permission you would use chmod o+r. The possible classes are u (user), g (group), o (others). There is also a special class a (all) which means all three classes. "All" is not a synonym for others. To clear or remove a permission, use class-permission (e.g., chmod o-r). The method above uses the symbolic mode for modifying permissions. There is second absolute (or numeric) mode as well. The permissions are actually bits and the three types of permissions (read, write, execute) for a class (user, group, others) are sets of 3 bits. The permissions (rwx) map to bit values (100, 010, 001) and their corresponding octal values (4, 2, 1). To set a permission, add the corresponding octal value, e.g., r-x would be 4+1 = 5. You need to do this for all three classes, e.g., rwxr-x--- = 4+2+1,4+1,0 = 750. (You are actually adding 400+200+100 + 040+010 + 000, but it's easier to calculate them as separate digits.) So to set those permissions, you would use chmod 750. Absolute/numeric mode can be somewhat confusing at first but it's really not too hard once you get the hang of it. There may be times where you would be required to use absolute permissions. The examples in this document will use symbolic mode. So right now everyone can read the file letter.txt. Let's fix that. Now what happens when another user, betty, tries to read the file? What about the execute permission. What does that mean? Earlier, we stated that just about everything in Linux is a file, including the commands you run. The execute permission is what permits the file to be run as a command as well as who can run it. So commands are files, too? Most of them, yes. The ls command is located in the "/bin" directory. You can use the which command to find the full path of a command. Setting the execute permission does not make a file executable; it allows an executable file, such as a compiled program or shell script, to be run. (We'll talk about shell scripts later.) So happens when you try to run an executable program that doesn't have the execute permission set? Let's try it with the fictitious command howdy. "Permission denied". That makes sense because the execute permission is not set. And if it were? What happens when you set the execute permission on a non-executable file and try to run it? Okay. Let's not do that again. By the way, did you happen to notice that when we tried to run the letter.txt file, we included a "./" in front of it? Sometimes you have to refer to a program using its path (full or relative) and not just by name. We'll explain why later. Permissions have somewhat different meanings for directories. It might help to think of a directory as a special file that contains the list of all of the files and sub-directories within it. We'll start with the execute permission. For directories, the execute permission is sometimes called "search" permission. It is needed in order to cd into the directory as well as access the files or sub-directories within it. It does not give access the actual list of files. To access a file within the directory, one would need to already know the name of the file as well as have read access to the file itself. Below, user betty wants to allow bobby (you) to read the file "/home/betty/shared/misc.txt". You can see that although everyone can read misc.txt, the enclosing directory only has search permission for the owner. Bobby is unable to read the file. Rather than give everyone access, betty can add group search permission. Both bobby and betty are members of the "users" group. Note that by adding the -d option to ls you can see the permissions for a directory itself rather than the directory's contents. So now that the directory "/home/betty/shared" has search permission set, bobby should be able to access the file within it. Correct? Not yet. In order to access the file misc.txt, not only does its directory (/home/betty/shared) need search permission, but so does its directory's parent directory (/home/betty), and its parent directory's parent (/home) all the way up to root (/). It's turtles all the way up. The /home and / directories already have have search permissions set (which is good because you wouldn't be able to chmod those - they are owned by user root). So adding group search permission to /home/betty should allow bobby to access it. Also because we are adding group permissions and not others permissions, user bubba (who is not a member of the "users" group) will not have access. Read permission allows one to list the contents of the directory. While there are times where you want to allow search but disallow reading on a directory, you typically will not see the reverse. That is, if you set read permission, you will likely set search permission as well. Write permission allows one to create, delete, or rename files in the directory. The touch command is a simple way to create an empty file. (By the way, if you touch an existing file, it updates the file's modification timestamp.) As you can see below, when betty adds group write permission to the /home/betty/shared directory, bobby is able to create a file within it. So bobby is now able to create a file within /home/betty/shared. But because bobby does not have any type of access (read nor write) to the flag.gif file, you shouldn't be able to do anything to that file, right? So not only were you able to rename the file, you were even able to delete it as well. What's going on here? Recall that earlier it was said that you can think of a directory as a special file that contains the list of all of the files and sub-directories within it. So adding write permission to the directory means we can modify that list. This includes renaming the entries in that list thus renaming the files in the directory. It also includes removing entries from that list thus deleting the files the files (although we did have to confirm that we wanted to delete a write-protected file). Without write permissions on the file, we would not have been able to edit and modify the contents of the file, but the ability to delete a file that we don't own might be a problem. But what if we don't want someone to be able to rename or delete files that they don't own? It was mentioned above that the three types of permissions for the three classes were three sets of three bits. There is actually a fourth set of permission-related bits. These extra bits are called the setuid (set user id), setgid (set group id), and sticky bits. The sticky bit is the one we are interested in. If set, it prevents a user from deleting or renaming a file in the directory unless they own the file or the directory. To set or clear the sticky bit, use chmod +t or chmod -t.
Notice that the world execute/search permission is now displayed as t. The sticky bit is set. If it were displayed as an uppercase T, that would have meant that the sticky bit is set but world execute/search permission was not. So now what happens when we try to delete or rename the file? [bobby@login001 shared]$ ls -ld . drwxr-xr-t 2 betty users 4096 Oct 24 15:17 . Now that the sticky bit for /home/betty/shared is set, we are unable to delete or rename the flag.gif file because we aren't the file's or enclosing directory's owner. Note that because we were the owner of the file "new_file", we were able to delete it. One of the directories that has its sticky bit set is "/tmp", a directory on the system that is writable by all users and is used to hold temporary files. We won't discuss the other bits (setuid and setgid) here. So where did the name "sticky" bit come from? If commands are actually files, then each time someone wants to run the ls command, the system has to read the ls file from disk and place it into memory before it can run. This takes time. Because ls is a popular command and is run often, it would be faster for everybody if the ls file just remained in memory, that is, it were stuck in memory all the time. Programs with their sticky bit set got stuck in memory. Okay, that was an over-simplification but it's fairly accurate. These days, most systems ignore the the sticky bit for files and only use it for directories instead. But the name "sticky" bit has stuck. Below are some more commands worth mentioning. Some of them, such as echo may seem very simplistic, but combined with other commands or included in shell scripts, they can be quite useful. For more detailed information on these commands, check the on-line manual pages with man. echo — Output a line of text. date — Prints the system date and time. w — Show who is logged in and what they are doing. This is similar to the who command but displays more information. At the very top you can see how long it has been since the system was rebooted (also known as uptime) as well as how busy the system is (load average). For each user, you can see when they logged in (and from where), how long they've been idle, and the command they are currently running. top — Display and update sorted information about processes. This command will continuously display the most CPU intensive programs currently running on the system. If the system seems slow, you can use top to see if something (or someone!) is hogging the CPU. When you are ready to quit top, press q.
wc — Print line, word, and character counts for a file. file — Determine file type. gzip, gunzip — Compress or expand files. The gzip (GNU Zip) command will compress a file, add a .gz suffix to the compressed file, and then remove the old (uncompressed) file. The gunzip command does the opposite. hostname — Show the system's host name. ssh — Remote login program. You can use the ssh command to log in to the compute nodes if necessary. diff — Compare files line by line. A useful option is -y which displays the two files side by side. grep — Search a file for a string or pattern. The grep command has an odd name but is very useful. With the -n option, grep will display line numbers as well. To tell grep to ignore case when searching, add the -i option. For some commands, it's obvious where their names came from. The who command shows who is logged in. The wc command displays a word count. So how in the world did a command that searches a file for some text get the name "grep"? Well, at first, the original programmers wanted to call the command "find" but there was already a command with that name. While they were sitting around trying to come up with a different name, through an open window they heard a bullfrog outside make a "grrrrrepppp" croaking sound and just decided to use "grep" for the name. Okay, not really. So where did the name come from? Search patterns are sometimes called "regular expressions" (abbreviated "regex", "regexp", or often "re"). Regular expressions can get complicated so we won't go into detail about them here. But a very simple regular expression can just be the actual text you want search for. To search for the string "Auto", the regular expression would just be "Auto". Easy enough. There was (still is!) a line-oriented text editor called ed and you would type commands within ed to do various things. For example, to print lines 1 through 4, you would enter the command 1,4p. To search for the next line that contains some text and print it out, you would enter the command /text/p. To be more accurate, the text there is actually a regular expression so the general command to search for and print the next line that matches the regular expression would be /re/p. What if you wanted to search for and display all of the lines in the file that matches a regular expression? You would use the "global" version of the command, i.e., g/re/p. That's where the name "grep" comes from. By the way, although the story above about the bullfrog was made up, there is a similar story about how another program got its name. On some unix-like systems (BSD/Berkeley unix derived systems) you could run a command to enable notification when you received email. When email arrived for you, you would get a line displayed on your terminal telling you that "You have new mail from betty" or something like that. At U.C. Berkeley, where early versions of BSD unix were being developed, there was a dog named Biff who would bark at the mailman whenever the (paper) mail was delivered. The email notification command, biff, was named for that dog. Mac OS X is derived from BSD and does, in fact, have the biff command. If you have a Mac, open a Terminal.app window and run biff or man biff. Be careful. If you redirect the output to an existing file with ">" you will overwrite the file with the new output. This is sometimes called "clobbering" and we'll show how to prevent it when we talk about scripts below. So what if you need to append to the file instead? You would use ">> filename" (two ">"s). Similar to standard output is "standard input" or "stdin". This is often you typing away at the keyboard. Recall our fictional program howdy from above. If you add a -q optin, the program will query the user for a name. The howdy program is reading input from stdin, in this case, the user typing a name. But like stdout, you can redirect from a file with < filename. When you redirect stdin from a file, it may or may not be echoed to stdout. That just depends on the program itself. Often, programs that accept a file as a command line argument will use stdin if no file is specified. For example, we could use wc to count the number of characters typed at the keyboard. When entering text this way, you will need a way to tell the system that you are finished typing. Typically, you will press ^D to do this. Below, we see an example of different ways of counting the number of characters in a sentence. The first method just specifies a file. The second method redirects stdin from that file. The commands look similar (the only difference is the < character) but way wc is reading the text is different. Notice that when you specify a file, wc includes the name of the file in the output. When stdin is redirected from the file, wc doesn't know from where the text originated so it can't print out the name of the file. The third method is using stdin from the keyboard. So a program that accepts a file name as an argument may also use standard input, e.g., the user typing at the keyboard, if the file is omitted. But users aren't going to type an entire document just to count the number of characters in it. So seriously... is this really all that useful? Why, yes. Yes it is. It is possible to chain multiple commands together so that one program's output (stdout) is another program's input (stdin). This is known as "piping" and is done using the "|" vertical bar character, aka "pipe". The ps (process status) command will print out information about processes currently running on the system. There are many, many options to ps but we will just use -ef which means shows full info for processes for all users. That's a lot of output. Let's say we want to get the processes related to user bubba. (There's actually a -u user option for ps but we're not going to use that here.) We could redirect the output from ps to a temporary file and grep that file for "bubba". We would need to be sure to remember to delete the file when we were finished with it. Fortunately, grep will use stdin if we don't specify a file. So instead let's simplify the above into a single command. Notice that in addition to bubba's processes, this included two others - our grep command and some command running as user root. This is because the grep command is searching for the text "bubba" within stdin, not listing bubba's processes. It's also possible to chain multiple commands using pipes. To count the number of "bubba related processes" pipe the above output into wc -l (line count). That worked as expected. Now it just so happens that the wc command does not like directories and it will let you know if an item is a directory. Let's create one and see what happens. The wc command displayed an error message. But we were directing output to a file so why did the error message display on the terminal and not get included in the file? Because in addition to standard output, there is a separate output stream for errors: "standard error" or "stderr". To redirect stderr to a file, you would use "2> filename". Note that although you can specify the same file for both stdout and stderr, you shouldn't because the file will likely end up corrupted. Why "2"? Where did that come from? These input and output streams are actually unix file descriptors and file descriptors 0, 1, and 2, are reserved for stdin, stdout, and sterr respectively. When you redirect from the command line, you are really redirecting the data for those file descriptors. So by adding "2> filename" we are redirecting data from file descriptor 2 (stderr) to the file "filename". We could actually redirect stdout with "1> filename" if we wanted but the 1 is implied and is omitted. What if we know that wc doesn't like directories and so we don't really care about error messages and just want to ignore stderr completely. We could always redirect stderr to some file but we would still to deal with leftover error files. A better way is to redirect stderr to a special file on the system, "/dev/null". The /dev/null file is sometimes called the "null device" and just discards any data written to it. We have seen references above to something called a "shell". A shell is the command-line interpreter UI for unix like systems. When you are typing commands at the command prompt, you are actually running a shell program. Above, we also discussed wildcards, I/O redirection, and pipes. It turns out that those features are actually provided through the shell and not individual programs. Traditionally, there are two major shell programs - the "Bourne shell" (sh) and the "C shell" (csh). Over time, these shells have been replaced by other shell programs such as the "Bourne-Again shell" (bash). These newer shells provide compatibility support for the older shells but have many other added features as well. You will still see references to sh and csh. The bash shell is the default shell for Kodiak users. One of the useful enhancements that bash provides is command autocompletion. As you are typing a command at the prompt, you can press the tab key and the shell will use the current context, such as the items in the current directory, and complete the word for you. You can also use the arrow keys to recall previous commands and edit the command line. Pressing the up arrow ↑ will step backwards through the history of previous commands that you have entered. Press the down arrow ↓ to step forward through previous commands. You can use the left ← and right → arrows to move the cursor back and forth to edit the current line. A quick way to move the cursor the beginning of the line is press ^A. Press ^E to move it to the end of the line. There are many more keyboard shortcuts besides these. To see them, along with a lot more info, run man bash. The shell is not just a command-line user interface that runs commands one at a time. It is possible to place multiple commands in a text file, called a "script" or "shell script" and run them all by running that script as a command. But wait! There's more! The shell doesn't just run commands. It also provides many features in "real" programming languages, such as variables, control-flow constructs and loops, subroutines, etc. Although shell scripts are executable, they are interpreted and not compiled. When you run your program on Kodiak (discussed in Part 2) you will actually be running a shell script which then runs your program. Not all scripts are unix shell scripts. There are other scripting languages, e.g., Perl, Python, and Tcl, as well. But we are only going to discuss shell scripts here. So let's take a look at a simple shell script. Below is a script that outputs the current date and time (date), current users (w) and a blank line (echo), then waits for 30 seconds before continuing (sleep 30). It does this three times and quits. The first thing to point out is that the script file name's suffix is ".sh". But this is by convention and not really required. You may also see other suffixes for scripts as well, such as ".csh" and ".py". Ignore the first line of the script for now. The rest of the script are just commands that get run as if you had typed them at the prompt. When we ran the script, we actually ran the sh command with the script file as an argument. Unsurprisingly, the command we ran (sh list_users.sh) is what is actually listed by the w command within the script. Now you may recall that earlier we said that the default shell on Kodiak was bash. So why did we use the Bourne shell sh instead if bash? Like many systems, on Kodiak the sh command is actually a symbolic link to the bash command. A symbolic link is special kind of file that points to or is linked to another file or directory, the target. When you access the symbolic link, the system automatically uses the target file or directory instead. There would have been no difference if we had used bash list_users.sh to run the script instead. Now, let's modify the script a bit. We want to print the date and users just once, not three times. We could delete the second and third sets of commands but we might want to go back to printing three times later. So instead we'll "comment out" the remaining lines. We do this by inserting a "#" character at the beginning of a line. When the shell sees a "#" it considers everything on the line after it a comment and ignores it. Now we want to run the script as if it were a regular command. Notice below that when we first try to run the script from the prompt, bash (our command line interface shell) gives us a "Permission denied" error. The first thing we need to do is make sure that the file is executable. While we're at it, we're going to rename the file and get rid of the .sh suffix to show we really don't need it. Also note that to run the list_users script, we still must do so with a path to the file by putting a "./" in front of it. You can see above that although we ran ./list_users, the system is actually running /bin/sh ./list_users. So how exactly did it know we wanted to use sh (really, bash)? Because of the first line of the script, "#!/bin/sh". This is a special comment, sometimes called a "shebang", that tells the system what program to use to interpret the script. You might be able to get by without including a shebang line because your current interactive shell will then try to interpret the script. But to prevent compatibility issues in the future, it's good practice to always include the shebang line. Because this script is very simple and doesn't take advantage of any bash specific features, we use #!/bin/sh (the "lowest common denominator" shell) for portability and compatibility in the future. If the script did require the bash shell, we would use #!/bin/bash as the shebang line. Why is that called a "shebang"? We saw earlier that the vertical bar "|" character is called "pipe". The "#" character is sometimes called "hash" (you may be familiar with the term "#hashtag"...) and the "!" character is sometimes called a "bang". So "#!" is sometimes called hash-bang but that is usually shortened to shebang. By the way, the "*" character is sometimes called a "splat". We've seen where to run a program we sometimes were required to specify it with its absolute or relative path. To run the list_users script (which happens to be in the directory /home/bobby/scripts), we must explicitly include the path to it (e.g., /home/bobby/scripts/list_users or ./list_users). So why do some programs work with just their names while others require a path? Because of the $PATH environment variable. Like "regular" programming languages, the shell provides and uses variables or "environment variables". You can echo them to see their values. Remember how "~" is a shortcut for your home directory? There is an environment variable for this as well: $HOME. To see a list of variables use the printenv, env, or set commands. You can create and set your own variables which is especially useful within shell scripts. So when you run the command list_users, the system searches each of the above directories, in order, for the executable file "list_users". Once it finds one, it runs it. If it doesn't find one, it will fail with a "command not found" error. Right now, the list_users script is located in /home/bobby/scripts which is not in $PATH. But we can see that the directory /home/bobby/bin is there. (Notice that there are several "bin" directories. These are standard locations for executable programs or binaries.) So if we move list_users to /home/bobby/bin, it should work. But suppose we don't want to move list_users to our ~/bin directory, but want to keep it in the ~/scripts directory. We can tell the system to include /home/bobby/scripts when searching by appending it to the current $PATH. Because any changes made to environment variables disappear once the shell script exits or when logging out, we must remember to set them back each time. This would be a major hassle, but fortunately there is a solution: startup scripts. These are hidden files, located in your home directory, that run when you first log in or start a shell. The bash man page actually calls them "personal initialization files". We'll stick with "startup scripts". drwx------. 13 bobby users  4096 Nov 11 14:49 .
drwxr-xr-x. 6 root  root   4096 Oct 17 14:05 ..
For bash the startup scripts are .bash_profile and .bashrc. Why two files? What's the difference? The .bash_profile script is executed for login shells, that is, you had to enter your username and password. The .bashrc script is executed for interactive non-login shells. Although these are mutually exclusive, as we'll soon see, the .bashrc script is run by the default .bash_profile so anything in .bashrc will also get run when you log in. Right now, we'll look at .bash_profile, the script that runs whenever you log in. Notice that the first line is not a shebang, but just a regular comment line. This script is only run by bash so the shebang isn't needed. The second bit of code is what runs the .bashrc file (after first checking if it exists). Don't modify that part unless you know what you are doing. The last part is the section that we care about. See the line "PATH=$PATH:$HOME/bin"? What that does is take the current, default, PATH variable (already set by system-wide startup scripts) and append ":$HOME/bin" to it. That's why we see /home/bobby/bin at the end when we echo $PATH. Recall that what we want is to be able to run scripts in the /home/bobby/scripts directory so we just need to append ":$HOME/scripts" to the end of that line. When changing a path variable like $PATH, always remember to separate directories with ':'. Also, you almost always want to modify PATH, either appending or prepending directories, so be sure and include the current value of $PATH there. If we were to leave out $PATH, (e.g., PATH=$HOME/bin:$HOME/scripts) then only those two directories would be in the current path and regular commands, such as ls, would not be found. Note that if you do this, you would still be able to run commands by using their full paths (e.g., /bin/ls). For any changes to .bash_profile to take affect, log out and log back in. At some point, you might be tempted to add the current working directory "." to PATH. That way you wouldn't have to always use "./" in front of programs and scripts to run them. That sounds like it would be convenient, right? Don't do it. Adding your current directory to your PATH is potentially dangerous, especially if it appears before the system-wide directories. Remember that the directories in $PATH are searched in order. What if some ne'er-do-well were to write a script that deleted all of the files and directories in your account? And what if he named the script "ls" and placed it in the /tmp directory? If you were to cd /tmp and ls and if "." were at the beginning of your PATH, the system would find the malicious script first, run it instead of the real ls command, and all of your files would get deleted. It's safer to just type "./" before your scripts. One more thing to mention before we do so. Note the last line in the script export PATH. By default, variables are only set and usable in the environment (shell or script) where they are created. To make them usable in sub- or child processes, that is, programs and scripts run by the current environment, they must be exported. If you make multiple changes to a variable, you can do that with multiple lines and export it after the final change. If you just need to set a variable or make one change, you could set and export it on the same line. The .bash_profile script is used to set default settings such as your $PATH variable whenever you log in. You can run other commands as well. For example, if you wanted to list the current users when you log in, add a who or w to the script. Or if you want to keep track of when you log in, add something like date >> ~/login_times.dat. Remember how redirecting stdout with ">" to an existing file would overwrite or clobber the file? If you want to protect yourself from doing that accidentally, set the bash "noclobber option" by adding a "set -o noclobber" line to your .bash_profile. If you try to redirect output to an existing file, the command will fail. To ignore the noclobber option and force the shell to overwrite an existing file, use ">| filename". So what is the .bashrc script used for? As we said above, it's for interactive non-login shells. What does that mean? There may be times where you may need to start a separate shell from the current one, for example, by explicitly running bash. Or you may be editing a file with vi and need to temporarily escape the editor (without quitting) to run a new shell to search for some other file or something. (In vi you do that by entering ":!bash".) You can run a single command on a compute node without logging in to it with ssh, e.g., ssh n001 'ps -fu bobby'. In all these cases, only .bashrc gets run, not .bash_profile. Some of the things that are often placed in .bashrc are "aliases" and functions. We'll just describe aliases here. An alias is just a "shortcut" command that replaces a real one. For example, if you find yourself running the command ls -laF often, you could create an alias lf for this. If you find yourself often (mis)typing "mroe" instead of "more", embrace your inner typo and add alias mroe="more". Or if you prefer to use less instead of more but keep typing more out of habit, alias more="less". If you are unsure which startup script gets called when, you can place a echo 'This is bashrc/bash_profile' command at the beginning of them. Be sure to remove or comment out those lines when finished. Extraneous output, especially from .bashrc, can sometimes cause odd problems. Below is list of commands mentioned in this document. For more information, use the man command. Ready to learn how to compile and run programs on Kodiak? Check out the Kodiak User's Guide.